Multi-specialty hospitals engage with medical practitioners of various specializations in different geographic areas. Their revenue and growth depends, to a large extent, on the strength of their relationships with the physicians they engage with. 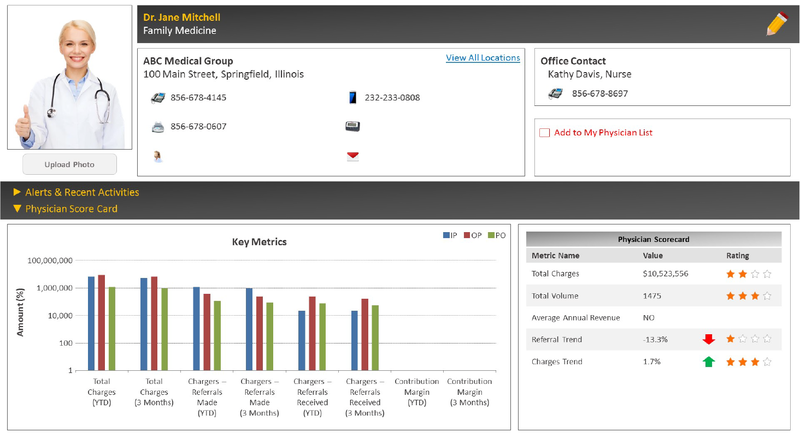 A leading multi-specialty hospital engaged Customer Analytics to develop a physician relationship management system that would enable hospital liaisons to identify the top volume/revenue generating physicians, and the most loyal physicians, through tools such as a “physician scorecard” to help maintain the hospital’s relationship with these physicians. Customer Analytics worked with physician rosters and the raw utilization data received from various hospitals to create a physician master and build a scorecard. The scorecard rated physicians on the basis of volume/revenue generated from cases attended, as well as cases referred and upward/downward trends over time with respect to these. A statistical classifier was trained to model physician’s “volume dispersion” or split of the physician’s patient volume between the client hospital and other competing hospitals (physician loyalty). Even though no direct data was available, this model was developed using various indirect data sources. Physicians were categorized as “high revenue–low dispersion,” “low revenue–high dispersion,” etc., to give the client hospital an overall picture of the proportion of physicians in each bucket and hence, the strength of their relationship with their physicians. Voluminous transaction data containing information on attending physician, referring physician, patient details, service and amount was standardized and appended with information such as NPI (unique identification for a physician), to help link transactions to physicians and derive measures such as number of cases attended, number of cases referred and associated revenue. Reports such as Top Specialties, Top Attending Physicians, Top Referring Physicians, and Revenue and Volume Trends were set up for the client. Based on liaison interactions captured in the physician relationship management system, performance reports based on the liaison’s engagement with the physicians assigned were also set up. The hospital was able to identify its most important physicians using the scorecard and ensure that liaisons are assigned to maintain the relationship with them. Liaisons were also empowered with a system they could use to focus their relationship management efforts to generate more volume and revenue for the hospital. The CA Physician Dispersion Model gave the hospitals a critical dimension on their physicians that they could not get on their own.